Western blot analysis of extracts from MCF-7 cells, untreated or IGF-I-treated, using Phospho-IGF-I Receptor β (Tyr980) (C14A11) Rabbit mAb (upper) and IGF-I Receptor β (111A9) Rabbit mAb #3018 (lower). 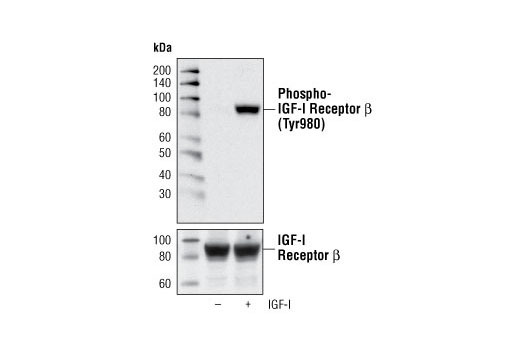 Phospho-IGF-I Receptor β (Tyr980) (C14A11) Rabbit mAb detects endogenous levels of IGF-I β receptor protein when phosphorylated at Tyr980. The antibody may cross-react with activated insulin receptors and FLT3. Monoclonal antibody is produced by immunizing animals with a synthetic phosphopeptide corresponding to residues surrounding Tyr980 of human IGF-I Receptor β.
Tyr980 of IGF-IR appears to be important for receptor kinase activation. Located in the IGF-IR juxtamembrane region, phosphorylation of this tyrosine residue creates a docking site for the binding of downstream adaptor or docking proteins (9). Pautsch, A. et al. (2001) Structure 9, 955-965.